Close to the center of the charming artists' village of Bergen NH and the European School we offer this comfortable detached house with outbuilding. The house is tastefully decorated and has a large sunny and fenced garden. At the front is a driveway where you can park two cars. Through the hall with a separate toilet you enter the spacious and bright living room with sitting area and a dining area with a large dining table. 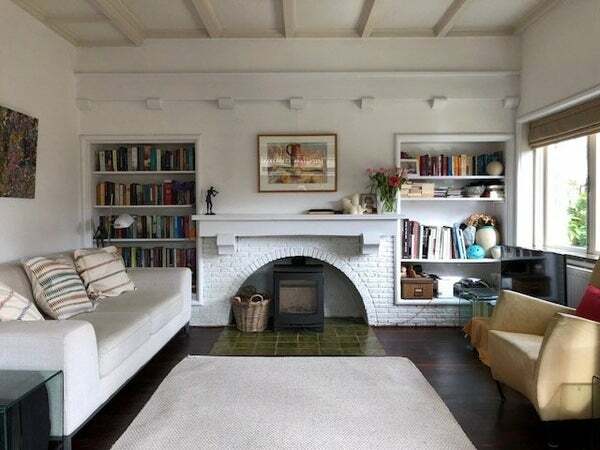 There is an attractive wood-burning stove in the seating area. The separate kitchen is fully equipped with, among other things, a dishwasher, oven, microwave, fridge, freezer, 5-burner gas hob and extractor hood. The kitchen gives access to the garden. On the first floor are two bedrooms, a storage room with washing machine and dryer and a luxurious bathroom. The bathroom has a bath, double sink and a separate shower. The master bedroom has a double bed, plenty of cupboard space and a desk. The second bedroom has two cots or a single bed. This bedroom also has a balcony that gives a view of the garden. In the outbuilding there is a living room / bedroom, second bedroom, a bathroom with shower, sink and toilet and a kitchen without a hob but with a microwave and refrigerator. The second bedroom in the annex is on the second floor. The bedroom has a double bed. The outbuilding is not only suitable as a residence for older children, but can also serve as a work space or as an accommodation for an au pair. Bergen is a lively artist village with many facilities such as restaurants, shops and sports facilities. (football, golf, hockey, tennis, horse riding). The nearest railway station is located in Alkmaar (about 4 km). Amsterdam and Schiphol Airport are within 45 minutes driving distance. Bergen houses one of nine European schools of Europe. Classes are taught in French, German, English, Italian and Dutch. In consultation it is also possible to get taught in other languages of the European Union.